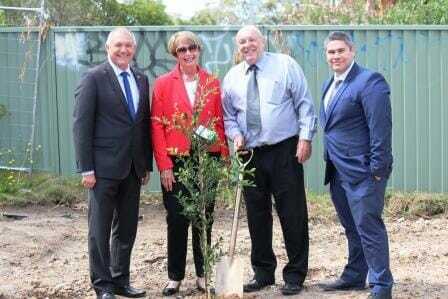 A milestone groundbreaking today marks the start of construction of a Central Coast Living Options (CCLO) development supported by Community Sector Banking – one of Australia’s first disability housing projects under the National Disability Insurance Scheme (NDIS). Not-for-profit disability services provider CCLO is building two five bedroom supported accommodation homes in Gorokan to help provide badly needed accommodation for people with a disability. The number of people living with a disability on New South Wales’ Central Coast is 25% higher than the national average. It is one of the first developments being built to meet NDIS’ “Supported Disability Accommodation” standards – which are designed to provide people with disabilities greater independence and dignity in their living arrangements. CCLO hosted the golden shovel groundbreaking event and tree planting at the site on Minnamurra Road to celebrate the start of development. The event was attended by from left in the picture, David Harris MP, Member for Wyong, Judy Andrews, Chairperson of CCLO, Kevin Johnston, CEO of CCLO, and Kieran Turner, Community Sector Banking State Business Manager. “This build symbolises not only a new groundbreaking enterprise for CCLO and Community Sector Banking – it heralds the start of a new era where people with a disability live with greater independence and dignity,” said Mrs Andrews. “We have been waiting five long years to bring our dream to fruition, and thank Community Sector Banking for partnering with us to provide finance for this construction,” she said. Mrs Andrews said there was a critical lack of disability housing in Australia. “It has long been difficult to obtain finance for disability housing developments, which has left Australia with a critical lack of homes for people with disabilities,” she said.